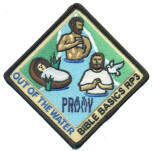 Bible Basics RP3 - P.R.A.Y. RP3: Read. Picture. Ponder. Put Into Action. 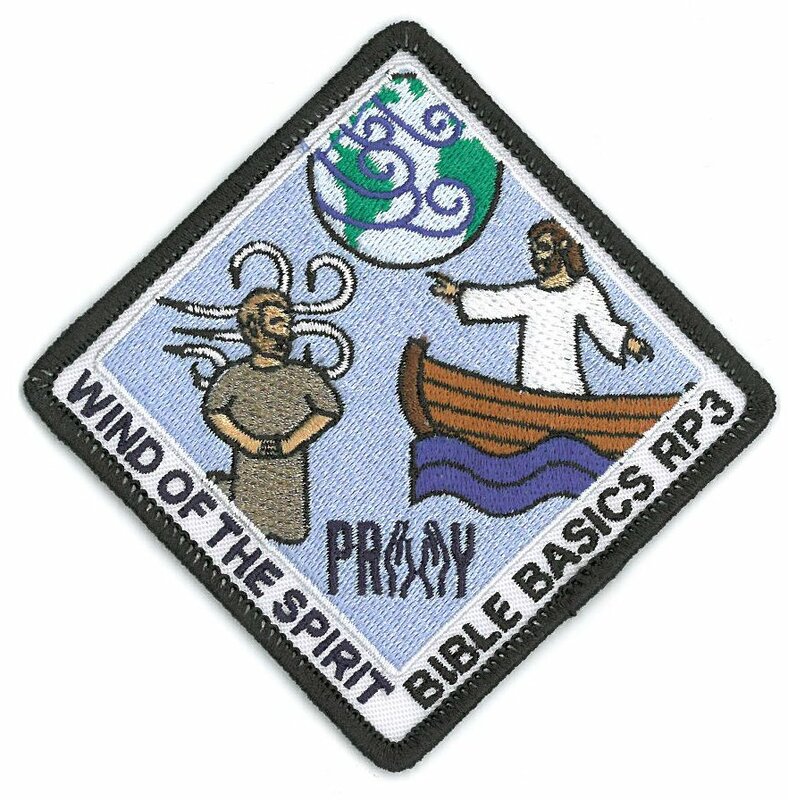 "Bible Basics RP3" is a patch series from P.R.A.Y. It is designed to help families, Sunday school classes, and scouting groups get into the Bible. We firmly believe that time spent in the Bible can be precious time with God. The Bible is basic to the Christian life, which is why the Bible is the emphasis of this new patch series. We're encouraging you to not only Read the Bible, but also to take the time to Picture the passage, Ponder its meaning, and Put it into action. That’s what "RP3" is all about. Families and groups taking part in the program will get to enjoy reading the Bible together, and become familiar with the RP3 outline and be equipped with a simple tool for personal Bible reading and study at the same time. Each patch in this series focuses on a simple object (i.e. water, birds, books, etc.) and includes 3 Bible stories that feature that object. Each patch will require 3 separate sessions (one session for each Bible story). Each Bible story will utilize the RP3 outline: participants will Read the passage, answer questions to Picture the story, discuss issues to Ponder its meaning, and choose an activity to Put into action. Patches are independent study units. The Good Book patch is considered the anchor patch and the first patch that should be earned. After that, the patches may be earned in any order. Need help choosing a patch? This chart shows the stories and lessons for each patch. Requirements are shared through the P.R.A.Y. Website and you can acquire them by completing the curriculum request form at the top of this page. The files will be sent to you via email when your request is approved. Ordering the patches is easy: patches are available through the P.R.A.Y. Online Store and may be ordered at any time. Each patch is designed to be a visual reminder of the Bible stories and can be used as a prompt for reviewing past lessons. 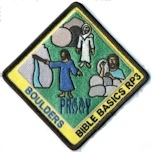 Bible Basics RP3 is a series for people of all ages (school age and up). The curriculum for each patch includes questions for younger children, older youth, and adults, and is designed to be done in a family or group setting with all participants (including parents and leaders) earning the patch. Print a one-page flyer for quick reference and summary. These patches are separate from the P.R.A.Y. awards and do not have the same strict guidelines as God and Me, God and Family, God and Church and God and Life. The patches are shorter programs, can be earned by all ages, and do not require workbooks or an application/review process by clergy. These guidelines make the new patch series ideal for weekend campouts and retreats. Although the patches are separate from the P.R.A.Y. awards, the patches can be used in conjunction with them and fill the gaps that exist between the different age levels. The patch series can also be used with unchurched kids who may not be ready to tackle the more demanding award curriculum; it can provide some hands-on Bible experience and generate success and excitement for advancing to the P.R.A.Y. Awards. Click here for a side-by-side comparison of the P.R.A.Y. awards and RP3 patches. Plans are already in the works for future patches featuring trees, fish, rocks, and storms. Be sure to get on the P.R.A.Y. email list to be notified when new patches are posted. Martin Luther said “The Bible is the cradle wherein Christ is laid.” It is our dream that “Bible Basics RP3” will be a catalyst in bringing children, youth and families to Christ and nurturing in them a lifelong love of Holy Scripture. See the Bible stories and lessons in one glance! Share your love of the Bible, consider sponsoring a new patch. A patch sponsorship costs $1,000 and helps provide for curriculum development, proofing and editing, layout and design, startup inventory, and other costs associated with creating a patch. Sponsors may be an individual or a group (i.e. a family, scout troop, church, youth group, etc.). The name of the individual or group will be printed on the patch handout. Sponsors will also be acknowledged in the P.R.A.Y. Annual Report. If you are interested in sponsoring a patch, please contact the P.R.A.Y. office at 1-800-933-7729. Coming soon - Sponsor needed! Sponsored by the Hazlewood's in honor of the Directors Emeriti of P.R.A.Y. Thank you for your vision, hard work, and friendship! Llewellyn Mallette sponsored the "Wind of the Spirit" patch in honor of his late wife, Chaplain Yolanda Mallette, who held various Boy Scout District leadership positions and also served as commissioner and trainer on the Commissioner College staff. The Mallette's lived by the motto, "We are Saved to Serve" as well as by Proverbs 3:6, "In all thy ways acknowledge Him and He shall direct thy paths." The idea for the “Holes” patch came from former P.R.A.Y. CEO Mark Hazlewood. 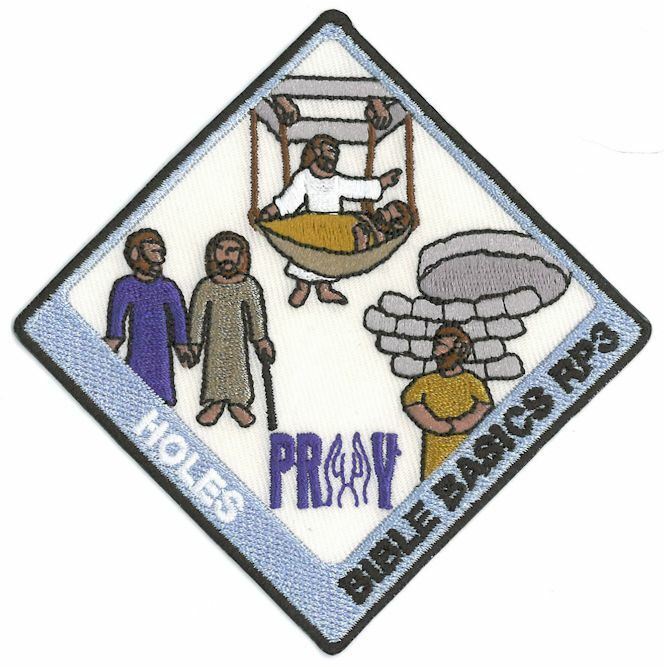 His family (including cousins and in-laws) is pleased to recognize his fun-loving, spontaneous nature and sponsor the “Holes” patch in honor of Mark’s retirement and his 33 years of ministry at P.R.A.Y. Angela had the unique opportunity to see how the Bible Basics RP3 series started as just a vague idea and wishful thinking and then grew through several transformations and ultimately the final product. Angela has always been excited about this series, but to have her step forward and sponsor a patch is very humbling. The Routh Family Foundation is happy to align with P.R.A.Y. to grow and strengthen Christian faith in youth and young adults. In support of the P.R.A.Y. mission TO BRING CHILDREN, YOUTH, AND FAMILIES TO CHRIST. *Patch names and designs are under development. Got questions? We've got answers! Check out these frequently asked questions. Search for and download free RP3-related files and resources at our Resource Library. Find RP3 teaching resources created and shared by others or share your own resources. What is "Bible Basics RP3?" 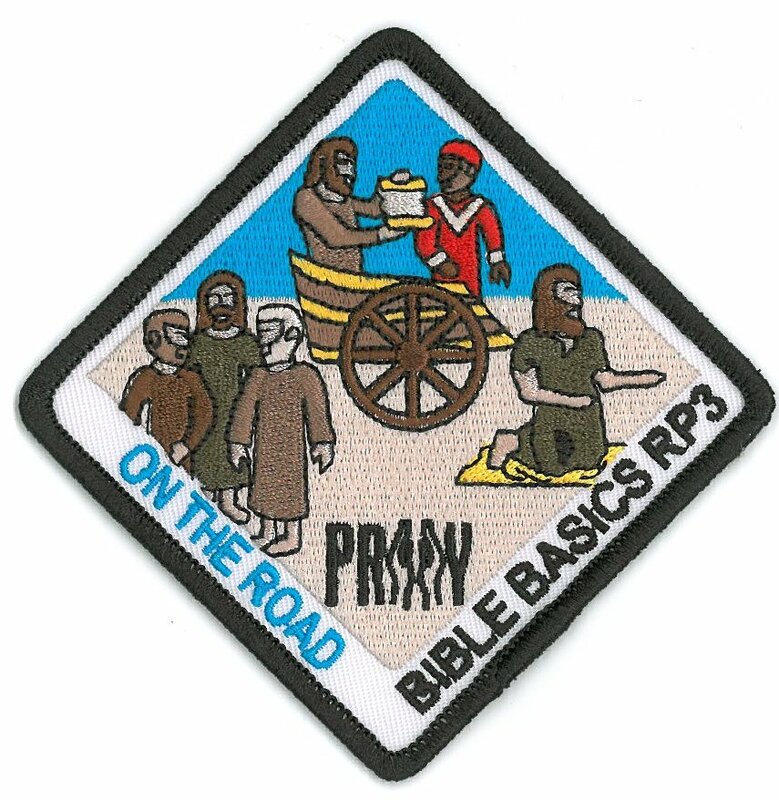 "Bible Basics RP3" is a new patch series from P.R.A.Y. It is designed to get children, youth and adults reading the Bible. Each patch focuses on a simple object (i.e. water, birds, books, etc.) and includes 3 Bible stories that feature that object. Participants are required to read the 3 Bible stories and complete the lessons. Why do you call it a “patch” series? The original concept was to create a patch series (as opposed to the P.R.A.Y. “award” series that already exists). Each study component is referred to as a “patch” even though the recognition items may include a pin as well as a patch. The actual patch will be 3 inches in size. What does "RP3" stand for? RP3 stands for “Read to Picture, Ponder, and Put It into Action.” It is a basic outline for personal Bible reading and study. The Bible patch series not only uses this outline, but one of the goals is to equip participants with a basic Bible study tool that they can use outside of the patch series. Click here for a detailed description of RP3. Do the patches have to be earned in a particular order? Although the patches may be earned in any order, “The Good Book” is considered the anchor patch and the first patch that should be earned. This patch focuses on getting to know the Bible, how to use it, and more importantly, why you should read it. How long will it take to earn a patch? Each patch is designed to take 3 separate sessions to complete (since each patch includes 3 Bible stories). Each session should take about 45 minutes. Please resist the temptation to take shortcuts and speed up the process. The goal of the patch series is to spend time in the Bible. The goal is not necessarily to earn a patch, but to learn how to picture the Bible story, ponder its truths, and then put it into action. Is there a required workbook? No. The curriculum is posted online and available at no cost. Since this is a patch program, participants are not required to record their answers in writing. No. The questions come directly from the Bible passage, and rather than provide an easy way out with an answer key, participants should struggle and wrestle with the passage and make discoveries together. We do encourage leaders to prepare in advance in order to better facilitate discussion. Is there a particular version of the Bible that should be used? No, please use the version of the Bible that you are most comfortable with. The leader should be a Christian adult familiar with the Bible and its teachings. If participants are new believers or “unchurched,” it is assumed that they will ask for help from their church or local congregation. What is meant by “younger” and “older” children? “Younger” can refer to elementary age children, and “older” can refer to middle school and high school students. The loose terms are intentional. Please consider the maturity level of the children and their church background when asking questions. The terms “younger” and “older” are meant to be a sliding scale and tool rather than a rigid delineation. If your group has a wide age range, please consider how you will accommodate the age differences to challenge and engage each member of the group. Are there different patches for younger and older children? No, all participants (even adults) receive the same patch. What groups can use this patch? 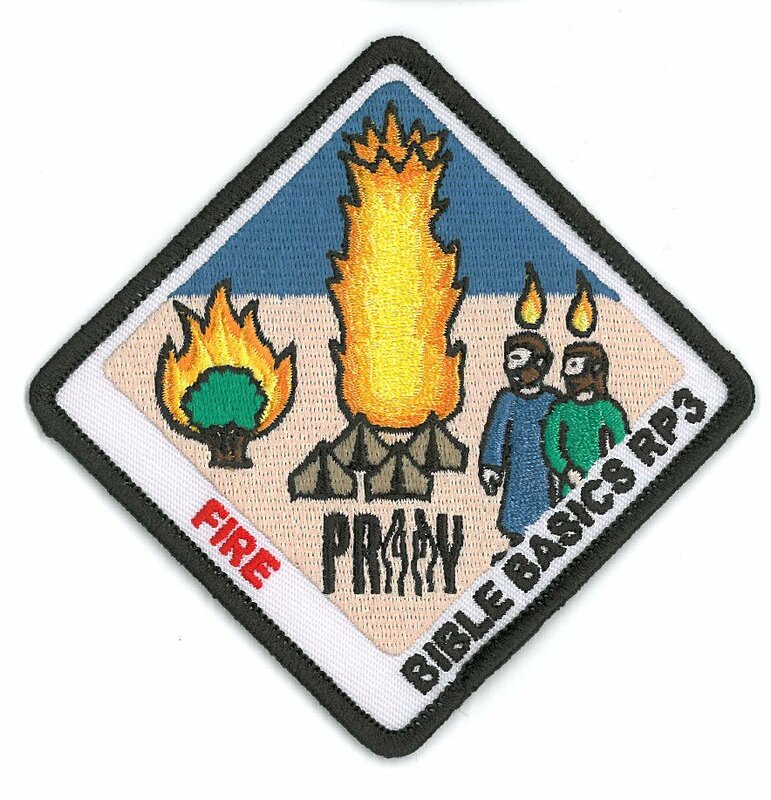 Any group interested in the Bible can use this patch! Sunday school classes, families, scout groups, homeschoolers, and other groups will all benefit from this series. Grandparents will also find this series to be a wonderful way to connect with and share their faith with their grandchildren. What settings can this patch series be used in? Stand-alone - The patch series can be a stand-alone program all by itself. Churches may want to announce special classes to offer the Bible Basics RP3 series. Add-on – Use the series as an add-on to a current program (use the patch series as part of a scout meeting to focus on religious growth). 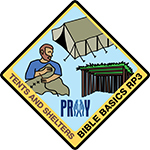 Camp - Take the patches out to camp and use them for devotions, to enhance the outdoor experience, and send campers home with a Bible patch. Is the patch series part of the P.R.A.Y. Awards (God and Me, God and Family, God and Church, God and Life)? Although P.R.A.Y. 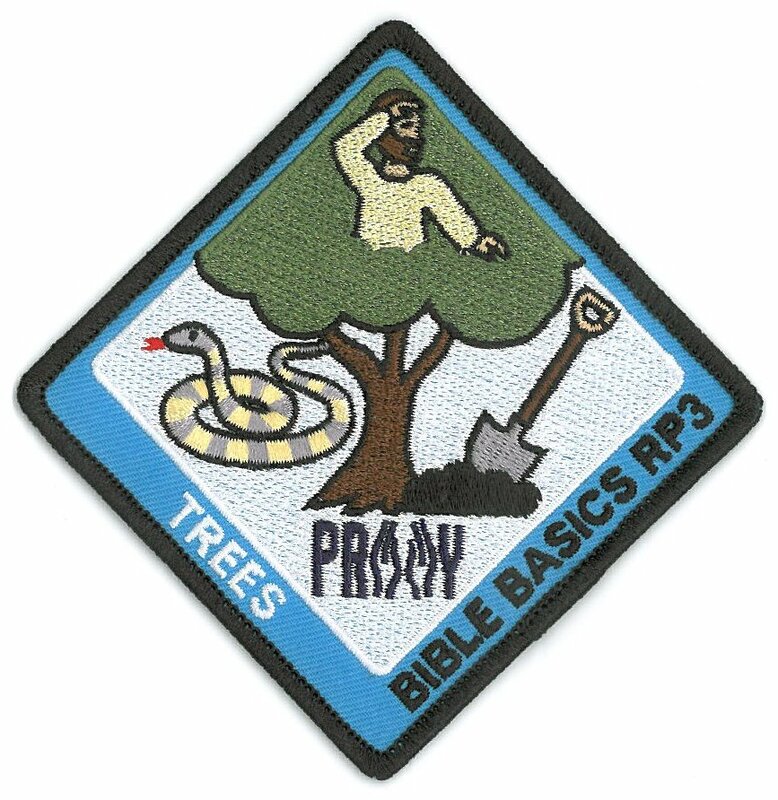 created the patch series, the Bible patches are separate from the P.R.A.Y. awards. One is not required for the other. Each has separate requirements and guidelines. Does the patch series qualify members of BSA to receive the square knot? No, this patch series does NOT qualify participants to receive the religious square knot. The square knot can only be received by earning the emblem of faith (i.e. God and Me, God and Family, God and Church, and God and Life). When can the patches be ordered? The patches can be ordered at any time. It is the responsibility of the adult parent/leader to present the patches only after all the requirements have been completed. Click here to order Patches and Pins. Does each participant have to fill out an application form to receive a patch? No, the patch series does not require any paperwork. P.R.A.Y. will not keep a national registry on patch recipients. How can this patch series be used by churches? The patch series can be used as a tool for Christian Education, family ministry, and also evangelism. Churches can offer the patch series and invite young people from the community to participate. They can also use the patch series to target scouts and provide an emphasis on religious growth while connecting with their families and doing outreach. The activities in the “Put It into Action” are marked for younger children, older youth, and adult. Remember, these are loose designations. Adults are not restricted to the ones marked “For adults only.” There are many benefits to doing younger activities together as a family! Although the instructions say to choose one activity, feel free to do as many as you like. One option is to review the RP3 model and make up your own questions and activities. This gives ownership to the children or group and makes the activities even more meaningful. Will there be new patches? Yes, the series will keep on growing. Future patches will include trees, fish, rocks, storms, etc. Be sure to sign up for email notices for future patches. Sponsors may be an individual or a group of people who donate $1,000 to sponsor one patch. The name of the individual or group will be printed on the patch handout. Sponsors will also be acknowledged in the P.R.A.Y. Annual Report. Thank you for supporting our mission to bring children, youth, and families to Christ!